One hot summer morning in 1986, Alan Evans, a professor of biomedical engineering, was walking across McGill’s downtown campus when he saw mathematics professor Keith Worsley sitting on a bench, pondering a large green maple leaf. He told Evans he was studying the question of variability: how individual things deviate from a norm. “Here he was analyzing leaves,” recalls Evans, who is based at the McConnell Brain Imaging Centre of McGill’s Montreal Neurological Institute (MNI), “when, five minutes away, we were sitting on a goldmine of imaging data that could provide exactly the same sort of fuel for his research. So I said, ‘Why don’t you come and study variability in the human brain instead? '” Evans had made another convert to Big Science. Over the past two decades, the scientific community has begun asking questions that can’t be answered by a single researcher, or even a dozen working together. These “Big Science” projects, such as mapping the human genome or finding a cure for AIDS, require expertise in a host of areas, and necessitate mining monumental amounts of data. Big Science needs a big network. 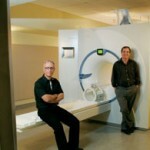 Alan Evans and his MNI colleague Bruce Pike, a Killam Professor in neurology and Director of the McConnell Brain Imaging Centre, are passionate about building such broad teams. Their projects may not be as vast as the Human Genome Project, but the principles are the same: bring together different disciplines in a coordinated network, share your data and get people talking—in this case, about the human brain. Already, Evans and Pike’s particular brand of Big Science is changing our understanding of neurological disorders. To construct a map of the average human brain, Bruce Pike (left), Alan Evans and their team captures hundreds of individual images using MRI equipment. Evans and Pike didn’t start small. In 1993, they helped found the International Consortium for Brain Mapping (ICBM), an ambitious partnership of four core institutions, including the MNI, which continues to collect—and freely disseminate—behavioural, imaging and clinical data from research sites around the world. With the information from ICBM, Evans and Pike built the MNI-152, a database that defines what is “normal” in the adult brain. To the layperson, this notion may appear, ahem, a no-brainer. The reality, however, is that healthy brains differ in size and shape so dramatically that researchers had no model for normalcy—and to fully understand the abnormal (read: disease), you need such a benchmark. The MNI-152 provides this point of reference, allowing researchers around the globe to untangle the origins and development of diseases in the brain. Having constructed the paradigmatic adult brain, Pike and Evans turned their focus to kids. By the end of 2006, they will have launched the world’s first online brain imaging database of pediatric brain development, the product of a seven-year collaboration between the MNI and six American centres, funded by the U.S. National Institutes of Health. American researchers working on the MRI (magnetic resonance imaging) Study of Normal Development project scanned the brains of more than 500 infants, children and adolescents, all carefully chosen to mirror U.S. demographics. Evans, Pike and MNI colleagues then compiled and analyzed the data to create a map of normal development in the growing brain. With this blueprint established, clinicians and scientists will be able to track abnormal development and fast-track early diagnosis. And Professor Worsley? He’s moved on from leaves —he’s now one of the world’s top authorities on variability in the human brain. This research is funded by the National Institutes of Health, the Canada Foundation for Innovation and the Fonds de la recherche en santé du Québec. For more information on the MRI Study of Normal Development, see “McGill’s brain-imaging database a first” in the June 1, 2006 issue of the McGill Reporter.